Calise (Camera Light Sensor) is an application that uses your computer's camera as a light sensor for obtaining the ambient brightness and then calculates and sets the correct backlight according to an user defined scale. DBus service optimized with automatic dawn/sunset recognition and weather information by using latitude and longitude. More info on Calise cam be found at its official website. Note: I've only tested it in Ubuntu 12.04 because it can't be tested in VirtualBox. Where "INTERFACE" is the file you've selected under step 2 (example: /sys/class/backlight/acpi_video1/brightness). Then, continue with the remaining calibration steps. Arch Linux users can install Calise via AUR. 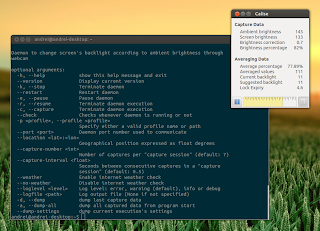 Download Calise for other Linux distributions via SourceForge.